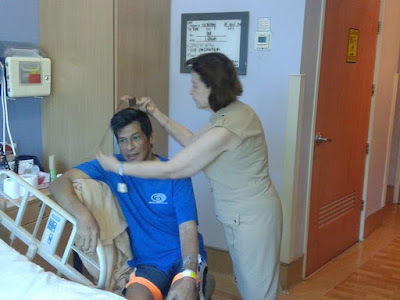 Actor Julio Diaz recently revealed that he is now out of the hospital and recovering well at home in Baguio City. As reported on ABS-CBN News, the actor, who was rushed to the hospital in critical condition after collapsing at his house back in April, stated that he is extremely grateful for the second chance in life, after his surgery successfully prevented a brain aneurysm. "First I have to thank the Lord, because He has lent me a new life," he said. Diaz said that he has also learned to cherish the life that he has, adding, "He gave it to you because He loves you and you should also love Him as He loves you." He is also thankful that his condition has enabled him to reconnect with his daughter and former wife. "Sadly, I wasn't there to see her grow up. It's nice to be able to meet her again after 14 years," he said.